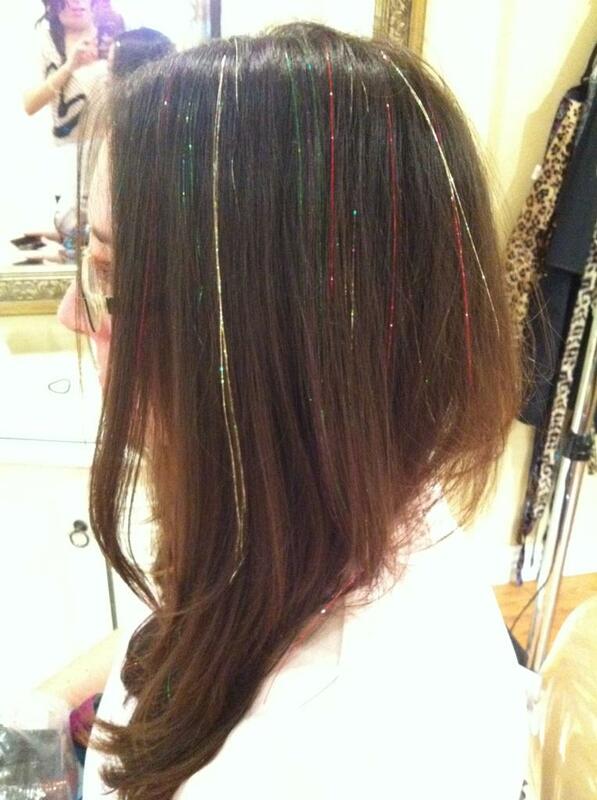 from a kindergarten boy: “where did you get that sparkly stuff?” “can you buy me some? 1. Bumblebees live above the sky and if you write something that goes above the sky (NOTHING ever should be up there), bees attack it. 2. Lava is that middle red line. Baby letters should never go above it (ie a, e, o, r, etc). “Tall letters” such as h, k, l as well as capital letters have lava proof suits so they can go above the lava. If a baby letter goes above the lava and shouldn't, it BURNS! 4. You can save yourself. Either by not making a mistake in the first place, OR by “saving” your letter by immediately erasing the mistake with “medicine”, aka the eraser. “Oh noo! The bees attacked! Quick, save your letter with your medicine!) If they save all their letters on a particular line, they become a doctor. “You saved all your letters! Good job, Doctor ___!” Depending on how well the child is doing, they can be a doctor at every letter, or every word, or line, or page, etc. I reward them for being a doctor with various tiny rewards. This week I used candy (cough) although I normally don't. 5. Another option if you want to work more on letter formation etc rather than erasing: “Zombie” letters instead of Doctor. They cross out the mistake letter and re-do it, the “zombie” letter. Or if you want to focus on erasing: You could deliberately make mini mistakes and then have them be the doctor that saves them (so the focus is on erasing rather than writing….a lot of my kids struggle with erasing!). I have to say that when I make a mistake, my kids ZERO in on it to point out what just got attacked/burned, lol….they notice tiny tiny mistakes. 6. PS: When using sentences, I tell them that if they forget the “guard bug” at the end of the sentence, the worms (or zombie, or something else scary) will eat up their entire sentence!!! Sounds complicated but kids who are ready to work on sizing typically get it right away. 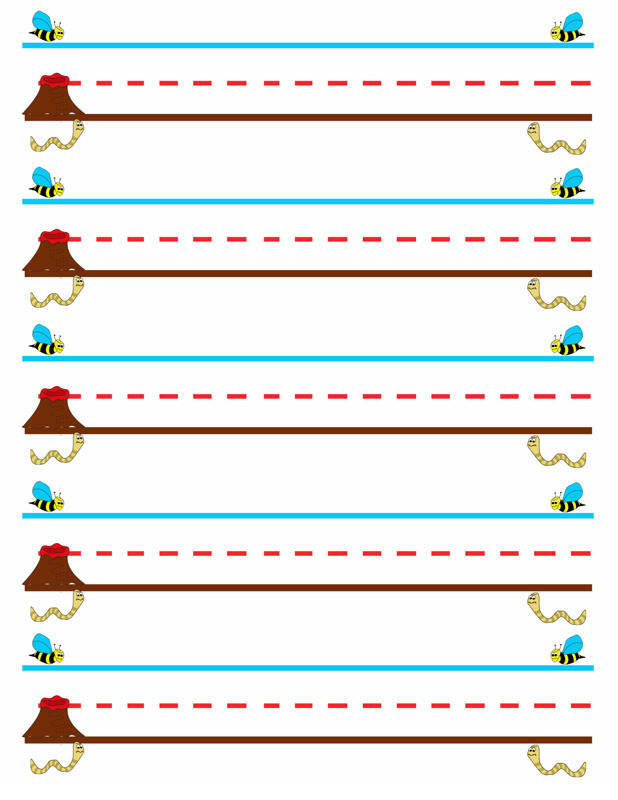 I first introduce lava, then worms, then bees….either within one session or several depending on level. Typically we start working on sizing/line orientation around the middle of kindergarten/end of kindergarten. When I first start doing it with them, if they make a mistake, I quickly draw a worm or bee or “lava” around the mistake to show them what happened. The way we decide what words to write is based on each kid and their preference. I was using my corkboard/pushpin game a lot, but retired it for a while and will re-introduce in January. For some kids we play CandyLand and for each turn we write down the color they land on. If the color repeats, they can choose any word off the board to write such as licorice. For other kids I have them randomly pick a card from my I Spy card game and whatever the item is, we write. For other kids we pick a theme for each line and they can generate their own ideas. Etc etc. Well I have so many other games/thoughts to share but this is getting quite long. I hope it doesn't seem too complicated….it's quite simple I swear! Just wanted to elaborate on some ideas. I hope to post a video really soon of me working with a few kids on it ( a friend's kids, not my OT kids, for privacy purposes of course). Some recent events I have discovered/learned/have occurred/whatever. My black cat is providing moral support as I write this by sitting next to me purring with one paw on my chest. *Angry Birds with a therapy swing: Take one therapy swing. Take stacked cardboard boxes with “pigs” (we used lightweight small balls) hidden within the boxes. Take one weighted ball of a few pounds dependent on kid's age. Have kid on stomach in therapy swing and throw weighted ball at cardboard boxes. (We had a few other lightweight things stacked in too, so it made noise). Explosion! As always, try this at your own risk, I take no responsibility if things go awry as you need to use common sense on how safe it is with your particular swing, child, weight, etc. It was quite popular with my little guys. *Used The Print Tool by Handwriting Without Tears – not a huge fan but maybe it will grow on me with time. Hurt my brain a little but I know other handwriting asssessments are worse. I am, however, a fan of handwriting without tears in general. *Tonya Cooley of TherapyFunZone.com awesomeness, helped develop the lava/worms/bumblebee paper! I think we're on a final prototype (I used it today with great success) and will be linking it soon. I also got a neat version from Munchkin! Tonya, by the way, dunno if I have mentioned using the “Eraser Superhero” (He needs a good name) – they can “save” their letters by swooping in with their eraser superhero. I was trying to think of a way to make it somewhat of a real game, where their eraser superhero can save letters up to 5x, blah blah, and the one with the most letters at the end (the ones that got bitten/eaten/attacked don't count) wins a prize or something. Must. ponder. further. I do like sky grass dirt paper and I think the lava/worms/bumblebee is similar in that we have dirt/sky, but I think of sky/grass/dirt as providing boundaries whereas lava/worms/bumblee (I need a bettr name for it lol), is more about the game experience of explosions, attacks, etc. Hmm. LAVA writing? LVB? Explosive Writing? Hmm. Black Cat has upped his moral support, now his entire body is pressed against me. I sleep SO much better without him, but it's too cold for his fragile little body so it's me or no where. Blah. I now have people at multiple schools calling me Miss Awesome (my kids at one particular school have evolved to Ms Awesomeness for some reason) and it CRACKS ME UP! I think it's hysterical. It really makes me feel good and bolsters me for the times I don't feel so good. The new fidget my kids have been creating: You take extra fluffy pipe cleaners or stemmies or whatever the heck they are called now, plus straws, and you cut the straws however you want, then stick the fluffy pipe cleaners within them, and make random creations and/or fidgets. But you want to bend the wire at the very ends down as it can be dangerous. I've been fencing with some of my kids at a particular school with principal permission, using obviously foam saber swords that I used to use way back when I fenced in college, when we were teaching the basics of saber fencing. It works on attention, impulse control, motor planning etc. The kids want to swing it all around and go crazy like in the movies but I teach them the different strokes, foot movements, etc…..they feel good and special about it and that's great. I've been thrilled lately with how the handwriting of my little guys has been improving….we've been using the lava/w/b technique all this fall and it seems to be working. They love when I make the tiniest mistake and pounce on it with their worms. Tonya had a great idea of using tiny stamps for the worms/bugs etc. I love that idea. I need to get some stuff to make my own mini stamps. I am trying to think of what else….I've been so busy lately that I haven't been able to write like I should. Last night I was up till midnight and then back up at 5:30am working on reports. So I came home, took a nap, then went to Pilates Plus, and now it's 1030pm and i should be asleep. I've turned off the lights in my room and hopefully sleep will come soon…. Um, I love thick bouncy dice….lately what I've been doing with my self-regulation seminar consisting of 6 kids is assigning them each a different number each time ( ie 2 is John Doe, 3 is Bob, etc) and then the first thing we do each time is movements. We used to do the 5 Tibetans but we've moved on to where I roll the dice, and then whichever kid/number it lands on, gets to pick the movement. Lately it's been pretty silly, like “alien dance!” – the kid demonstrates and we imitate for roughly 20 seconds (seems short but it's a long time when you are running around acting crazy). I love seeing all 6 of my kids plus a few adult aides running around the room joyfully doing silly things. Once all six of them have had a turn and gotten our engines revving, we start to slow things down. Sometimes we use stress busters or relaxation techniques from the Sensory Drive-Thru menu, sometimes we make fidgets and listen to native american indian flutes (the kids loved it), sometimes we play with theraputty and discuss different ways to self-regulate, etc etc. I used to REALLY REALLY dread it as I am NOT a group person and really prefer 1:1, but I am learning and enjoying it more and more. Kids have so much to teach us too! I think next week we will play some form of “high engine, low engine” that may be similar to red light green light, but walking fast versus slow motion, etc….not sure. Need to ponder how to make that work. I spend a lot of time with ideas in the back of my head like the one I just shared, and then eventually if i am lucky something clicks and I go ahead with it. I also experiment a lot, USUALLY with acceptable results. Black Cat has decided to provide even FURTHER moral support by lying on me in such a way that I can barely see the keyboard/screen! So this has gotten really long………..basically I continue to LOVE LOVE LOVE my job as a school OT (mostly because I looove my co-workers, area, kids, etc) although I think it's semi unusual in that my caseload consists of relatively high functioning kids as they are all general education. I do have rough days/weeks like yesterday where I have wayyy too much work and get stressed, but overall, love love love it. Still continuing to get tons of great emails and I wrote Sam G. at AOTA to ask if there was a place I could send some of them to get answered as I am sooo behind again on responding. He said try goin to the prospective student chats that are monthly or see some of the forums at otconnections.aota.org…….I'll go see if he said anything else. But I DO RESPOND it just takes me awhile. I apologize. As always. Anyone who has followed my blog for the last 4+ years!!! knows I have a love/hate issue with email…love getting it, love reading it, and love responding, it just takes me many months!! Anyone who has good ideas or wants to share stuff, go ahead….my current muses are Tonya at TherapyFunZone, the OT who runs the Public Schools OT blog, and pinterest.com/funkist/ot-ideas, as well as random life…and STILL got a few reviews to do, just remembered….Dycem, Linda, and PenAgain. Over Christmas break is my final goal. If I don't do it by then you all have permission to beat me with a huge stick. 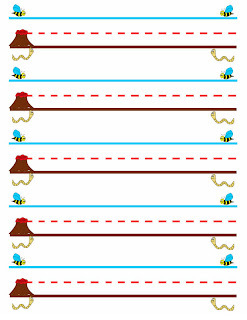 Here is my worm/lava/bumblee paper. 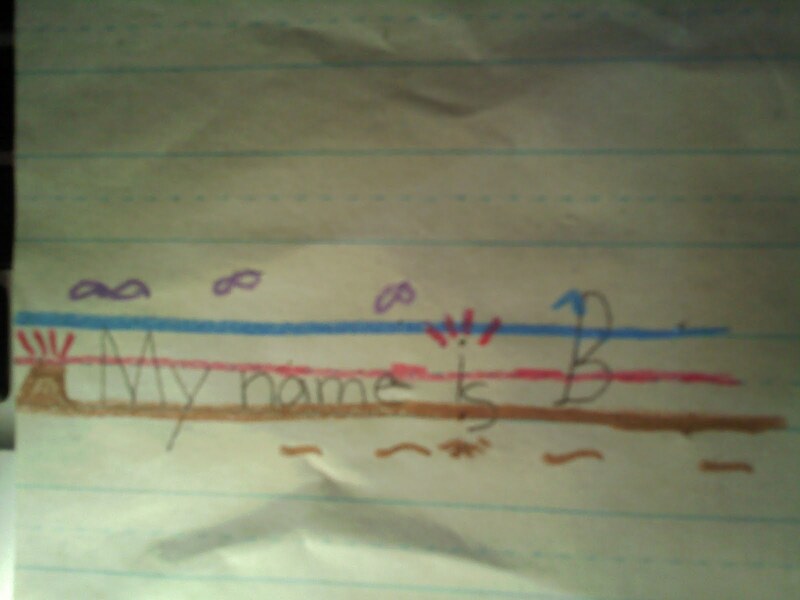 Basically The blue line is sky and the brown line is dirt which is like the sky/grass/dirt paper already out there. 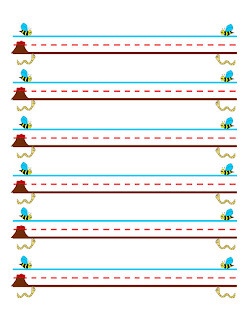 The middle line is lava and it burns baby letters that go too high, ie a, e, r. Worms live under the lines and attack letters that go below the line that shouldn’t (but they love tail letters like g, y, p, and get mad if the tail doesnt go below the line), bumblebees live on top of the lines and sting if you go too high. Sounds complicated but the kids grasp it quickly. So in the following sample, “My name” is perfect. the “i” in is went too high – above the lava – and got burnt up, ouch. The “s” in is went too low and got attacked by worms (I usually say something like augh!! worm party!!). Then the “B” is too high and got stung by bumblees (should have been same color but I was working quick and forgot). So I like to provide the paper and the kids write. With each letter, as they go (when they are first learning), I’ll be like “ooh perfect” or “AUGH ITS BURNING ITS BURNING AUGHHHH” or “ouch, a bumblee just stung him” etc etc. Its really silly and dramatic and they like to draw in the red burn lines or worms or bees….so for a while it looks kind of messy with all the additions, but they get the concept. Typically I start with working on lava or worms then add in the other components as it gets a little overwhelming otherwise. And I ask the teachers/parents to also just focus on either a few letters a week and/or one aspect a week such as spacing, or sizing, etc, so its not a huge stress battle for each letter every day. Hope that helps…I may see if I can get a friend’s kid to work with me so I can record it. Wow, I so desperately need to catch up this blog. I have lots of new ideas/activities to share + some sweet stories, etc. Unfortunately I've been running around like crazy. December is a rough month. One of these days I'll get to it!!! I think of my blog with longing almost every day and all the things I need (okay want) to share!!! So I have two new things I've been doing a lot lately. One is “High Five”. I remember reading a (fictional) Emily Giffin book about a child who was severely burnt – she had OT in the hospital. The mom recounts how one of the doctors or something got the child to give her a spontaneous high five and she deliberately put her hand up high – the daughter put her hand up higher than they could ever get her to do in therapy, to deliver the high five. Because it was a joyful spontaneous act. So I've started doing spontaneous high-fives but with a twist….I immediately go into “high four, high three, high two, high one, high zero!” where I manipulate my fingers into the various numbers (ie high four is the four fingers with the thumb in the palm…high three are the three fingers, etc). The kids are caught in the moment and don't fuss, even though its often quite challenging for them to manipulate their fingers into the right patterns! And it's cute to do a high one with just your index fingers touching, lol. I go through stages where I tend to use the same game a lot….for example I was using my corkboard alphabet game a TON, but this last week I've given the kids a handwriting break and we've done a lot more of the hand manipulation stuff (which can help handwriting). 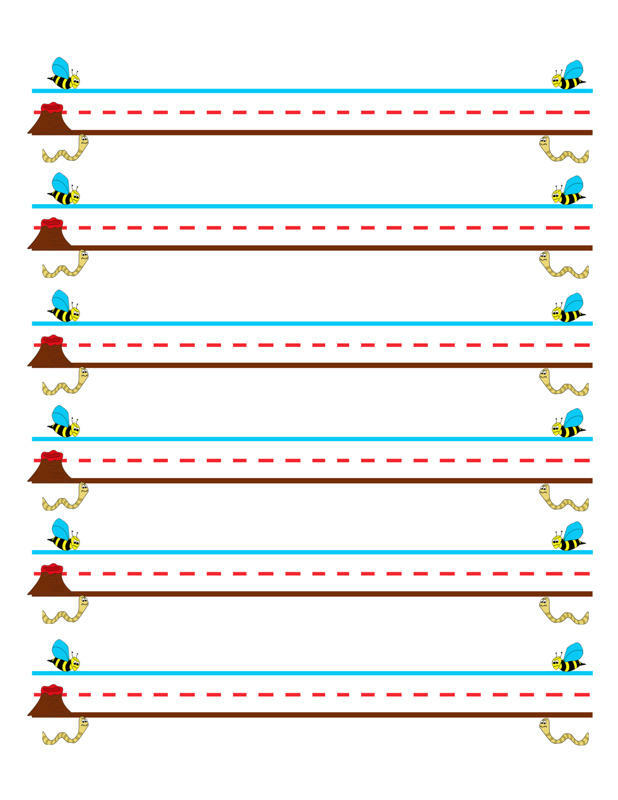 I also got a $5 weaving loom at Wal-mart (boo hiss) and I was impressed that I had several kindergarteners that could loop with it…they couldn't weave, which I didn't expect, but honestly I was even impressed they could loop! Today I was in a first grade classroom when a child signaled to the teacher that he needed to do something. I think one finger means bathroom and two means drink, or opposite, I forget, anyway, the child got confused with his fingers and actually flipped the teacher off (without realizing it). She looked at him stunned, then told him he could go ahead. (She realized it was an accident/mistake and that he didn't know what he did). None of the other kids saw it but her and me. But as soon as he had left the room we (quietly, subtly) laughed so hard we were practically crying! Gotta love elementary school. 🙂 I am personally a fan of using the twisted fingers “R” for restroom and three finger “W” for water, which is actual sign language…. The last two days have been a little odd because of assemblies and Thanksgiving feasts etc…I don't pull kids out of class parties etc or assemblies, so I had to scramble. Sometimes you plan and get all this stuff out for a kid and then it falls through for reasons like that. I used to carefully plan each kid each day, but now I often just get a general vision and go with it. I know not all my sessions are 100% awesome and inspired, but I like to mix things up and keep it creative/silly, so I think USUALLY it is a good experience. It seems like, knock on woods, my kids are doing great lately with handwriting. I keep getting glowing reports on their handwriting changes! They seem to really respond well to the lava/worms/bees, which I know I need to post in more detail on here. I think I am going to try making my own paper, a lot like sky grass dirt paper, but with my stuff instead. And I do like the Mead paper at Target developed by an OT (look on the back page of the journals etc). I always daily think of stuff to share but then it often leaves me! I have been pretty busy with initial OT evaluations, triennials (the big every 3 year evaluations), annual IEPs, 30 day reviews, etc. 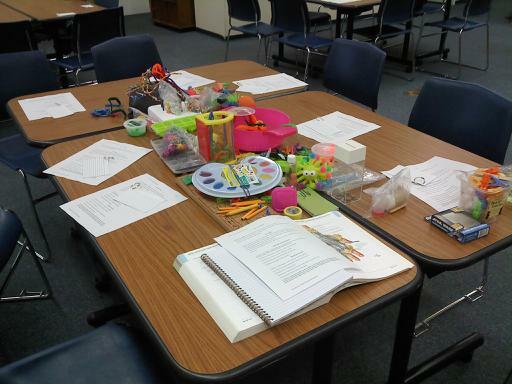 If I am not seeing kids I am either evaluating kids, consulting on kids, observing kids, or in various meetings. Last Friday I was supposed to hit 4 schools by noon but because of a late meeting with a mom I only got to three, but that's okay. I've had a lot of REALLY LONG mom e-mails lately. I can understand where the parents come from, but wow, sometimes it is overwhelming. I definitely do a LOT of work from home. Still LOVING my job though, and LOVING my co-workers….had a 3 hour Happy Hour with the special ed team last week! (I only drank a single beer and then a shirley temple…the three hours was because of the company, not the alcohol!!). They are all so much fun to work with. Teachers are such a sweet lot. 🙂 I am blessed with my kids, my co-workers, my schools, my bosses, etc. (School Steps Inc…google them! Fun company to work for!!). Hmmm what else. Oh yeah! I am presenting in Indiana at the AOTA conference in April, along with four other bloggers…our leader is Cheryl of OT Notes. We met up on Google Plus on Sunday night for a meeting about our presentation. I have never used Google plus before but it was so neat, like a 4-way Skype! (One of our members didn't make it). It was my first time chatting with any of them “in person”. One is in Canada and I think the others are all on the East Coast. The presentation is about social media and OT. Should be cool. It's going to be on Saturday morning and is AOTA sponsored, y'all should totally come!! Believe it or not, I STILL have my bag of OT conference stuff by my side along with my products to review. It sits by my bed (my office is my bedroom, shh I know its bad feng shui etc). I look at it daily. I WILL GET TO IT! I WILL GET TO IT!!!! I have a lot of paperwork to catch up on the next few days (we get 3 days off for Thanksgiving). When we get back I have to figure out how to do like 4 evaluations within a single week, because the week after that I have an annual, then another annual with a HIGH PROFILE ADVOCATE, then a triennial, and an OT evaluation. Oh and report cards are due so I need to annotate my goals ASAP. Ack. Must. Not. Think. About. That. Tonight. Or I will never sleep. 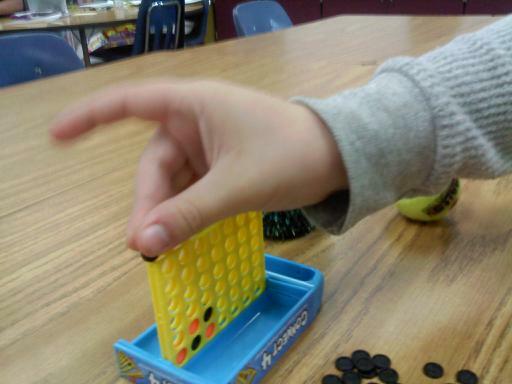 The kids think my tiny Connect 4 is the cutest thing EVER and they love it….it's insanely tiny, see how its smaller than this 1st grader's hand? Notice the child is using his middle finger instead of index finger….this tends to be typical of kids who have some fine motor issues……the middle finger is technically more aligned with the thumb and therefore a little easier for these kids, but ideally we want them to switch to their index finger as that is, biomechanically/anatomically, a better fit……I should be able to spout off musculature and stuff, but uh, I've been out of school too long. Better go review my Benbow stuff lol.